Mention the words St Moritz to most people, and their thoughts will turn to the exclusive ski resort in the Swiss Alps. But you can have your own slice of luxury closer to home at Cornwall’s sumptuous St Moritz Hotel and Spa for the perfect winter break – and if you really want to be sporty, just swap skiing for surfing. 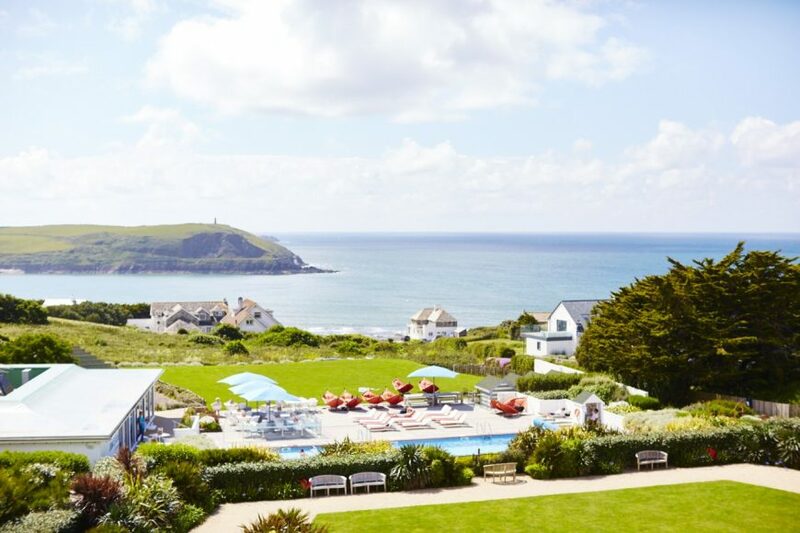 Located in a truly stunning cliff top location with views across the Atlantic Ocean and the Camel Estuary, the St Moritz specialises in laidback luxury and features the only Cowshed Spa outside of a Soho House property. 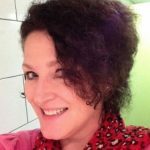 As I’m not a Poldark fan, instead of wanting to follow in Aidan Turner’s footsteps and check out filming locations, my trip to Cornwall was all about relaxation, beach walks and getting pampered, and eating fabulous food to boot. 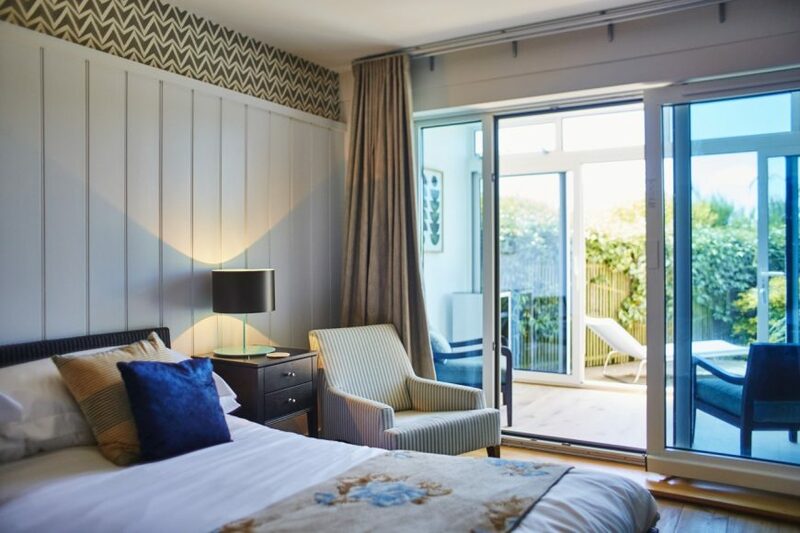 The St Moritz also handily sits between the pretty, pocket-sized seaside resorts of Polzeath and Rock, both renowned surfing, water sports and foodie destinations. There are breathtakingly beautiful walks to be had to both villages along the cliff top coastal paths that skirt the bottom of the St Moritz, with incredible views across the magnificently beautiful golden beaches and craggy cliffs of north Cornwall. Every room is just a short stroll to the shore. We stayed in a Junior Garden Suite (room 10G) which was wonderfully private. Although we had no seaview, there are plenty of rooms, apartments and self-catering villas which do. It depends what you want, and we wanted cosy looking out onto the gorgeously planted gardens. Every bathroom is fully stocked with luscious Cowshed products, and our beach chic room featured a very comfy king-size bed with exceptionally luxurious, high thread count bedding, with perfect pillows and plush velvet cushions. The room also featured a lovely leather armchair and a beautiful mirrored glass Art Deco style dressing table. 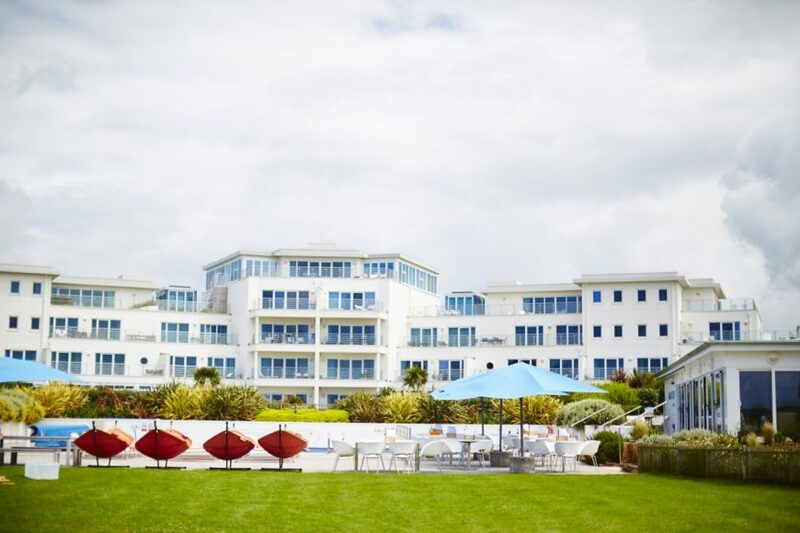 In fact, the whole hotel has an Art Deco air about it, especially the architecture of the main building, which looms like a beautiful white castle on the dark Cornish cliffs, but with all the mod cons and contemporary style you could wish for inside, both in the rooms and in the spacious, tastefully decorated communal areas. There was a St Moritz built there in the 1930s, but that was replaced by the new incarnation, a £15m development which opened in 2008 and which took the original as its stylistic inspiration. There’s Sky TV with all the trimmings and a DVD library if you need it. The bathroom has a rail to heat your towels at the touch of a button and a mini bar that won’t break the bank, featuring decent mini bottles of wine at £4, with spirits at £4 a pop too. There’s also a complementary pint of fresh milk for tea and coffee, accompanied by Cornish cookies. Tasteful rattan furniture adorns the attached sunroom with doors out onto an outdoor furnished patio next to the beautiful grounds, which also include a huge outdoor heated swimming pool and the Sea Side cafe. For those who don’t want to brave the elements, there’s also big indoor heated swimming pool with Jacuzzi, steam room and sauna, and a fully-equipped gym with qualified personal trainers to talk you through your fitness plans. An open kitchen means it’s plain to see the love, care and attention that’s put into the dishes, which feature as much locally-sourced meat, fish and veg as they can muster. 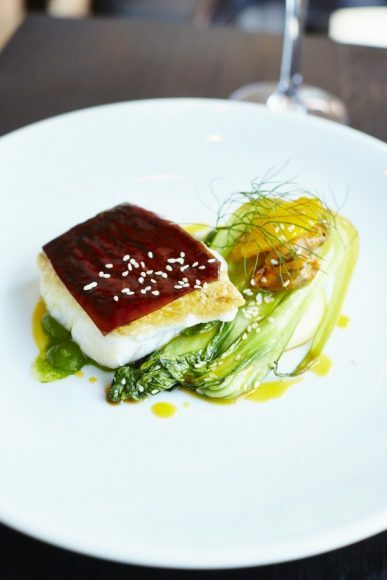 The very lovely head chef David Williams told me that he gets up at 4am every day to get the ‘fish report’, and he then writes that day’s menu according to the very best, freshest fish that’s been landed on the Cornish coast that day. My starter, a delicious seafood terrine with a watercress and citrus salad, with spiced tomato, was divine, as was my main of spankingly fresh Cornish pollock with mussel broth, creamed mash and spinach. My partner’s dishes of pigeon with black pudding and blue cheese glaze, followed by sea bream with savoy cabbage, new potatoes, carrot puree and braised shallots were just as to die for. Another incredible sweet feature at the St Moritz is the hotel Land Rover, which is at your beck and call to take you anywhere in an eight mile radius. On the Saturday, it took us on the short drive down to Rock to catch the ferry over to Padstow, for an incredible lunch at celebrity chef Rick Stein’s flagship The Seafood restaurant, before a wander around the very pretty village. We even managed to squeeze in a drink at the Mariners pub in Rock on the way back, which belongs to another celebrity chef, Nathan Outlaw, before the Land Rover took us back to the hotel. On the Sunday, it was time for me to herd myself along to the spa for a Cowshed Moody Cow massage. 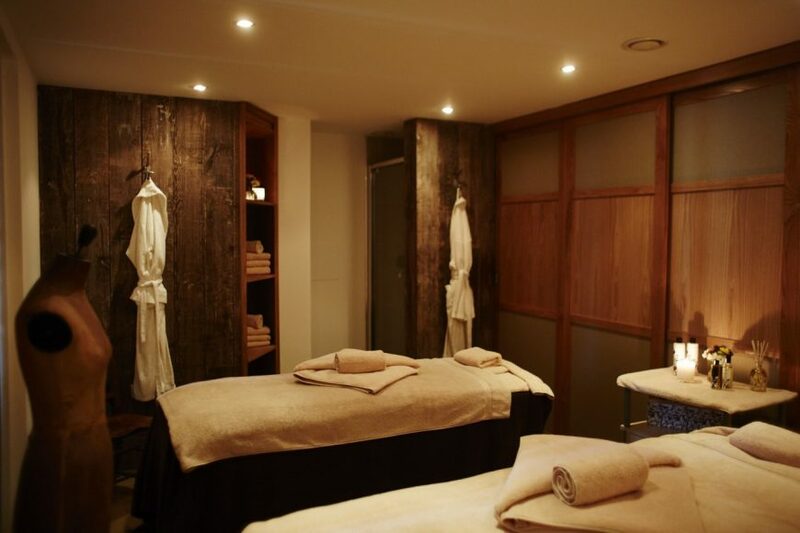 Featuring six dedicated treatment rooms, as well as manicure and pedicure stations and a relaxation lounge, the St Moritz Cowshed spa has a welcoming, down-to-earth style about it. 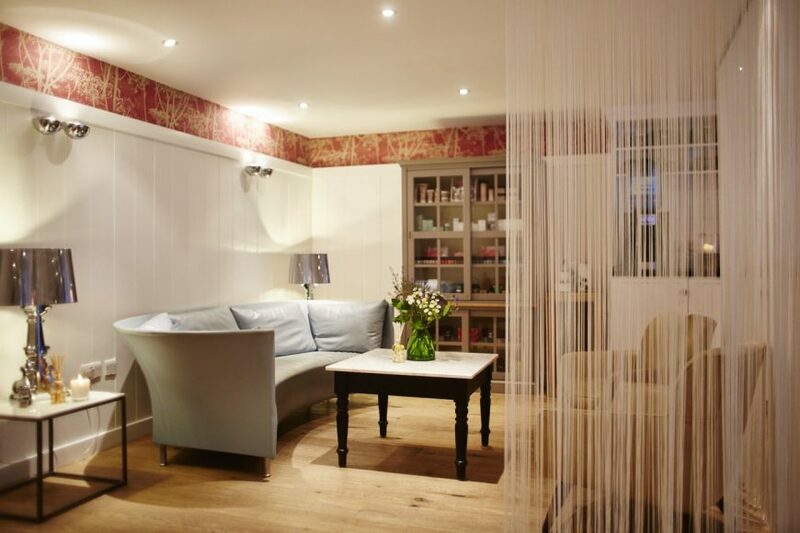 After filling out the medical forms in the beautiful Cowshed reception, I was collected by therapist Sammi and taken through to one of the spa’s treatment rooms, kitted out with calming pale woods and lit Cowshed candles wafting wonderful smells into the air and instantly relaxing me. Before we got down to business, Sammi asked me to sniff a sample of 10 different sorts of Cowshed massage oil, featuring different blends of essential oils and botanical ingredients. Handily, the one I loved most was Horny Cow body oil, which is apparently the best for dry skin and tired muscles – both of which I have. A mix of rose absolute, cinnamon, patchouli and vanilla, I liked it so much I bought a bottle afterwards. Sammi was exceptionally skilled to the extent that I think she must have magic fingers. I’d asked for a firm massage in a bid to untangle some of the gnarly knots in my back and shoulders, which is usually pretty uncomfortable, if not painful. Yet Sammi had me almost falling asleep at the same time as successfully tackling them. I still can’t work out how she did it. Utterly rejuvenated, I was then raring to go for one final stunning coastal walk along the cliffs and down to the breathtaking Daymer Bay. I can only imagine how amazing St Moritz is in the summer too. But I can’t imagine anywhere better for a relaxing beach escape in the British Isles, whatever the season. A Junior Garden Suite starts from £190 a night B&B. Half day spa package ( 3 hours of treatments ) from £200.